This month's guest blog comes from Watershed Protection's blog, Creekside Story. You may have heard the term “rain garden”, but many people don’t know what a rain garden looks like or how they can help restore our creeks. Basically, a rain garden is a shallow depression in the ground that collects water during a rain storm. The water that collects in rain gardens soaks into the soil and eventually makes its way to our rivers and streams as “base flow”. Without rain gardens the water from a storm would flow off impervious surfaces like roofs, driveways, streets and parking lots directly into the creek all at once. This can be very bad news for our streams, because that big slug of dirty stormwater causes erosion and may cause flooding. And then, after the storm passes, since all the water went quickly downstream, the creek dries out fast, and nothing can live in it. This is a problem with all our urban creeks. So how does a rain garden solve these problems? By slowing the stormwater down that is coming from all the buildings and roads and parking lots, cleaning it, and pushing it into the ground. Impervious surfaces can be “disconnected” by digging out a low place in your yard or other green space and directing the runoff into it. The more disconnection we can do, the healthier we can make our creeks. Look around your neighborhood for places where storm water could be directed into a rain garden. What makes a rain garden NOT just a hole in the ground is the plants. Not only can rain garden plants be attractive to look at, but the deep roots of rain garden plants act like drain pipes that move water down into the ground when the rain garden fills up after a storm. As water moves through the soil, the pollutants and nutrients washed in with the stormwater are filtered out, cleaning the water as it makes its way into the ground. These depressed gardens collect water, nutrients and carbon every time it rains, all the ingredients you need to make happy plants. In our hot dry summers, a rain garden with deep rooted plants can maintain soil moisture and keep plants alive longer than most other habitats, often without any extra irrigation! Another major benefit of rain gardens is that they provide habitat for pollinators and increase plant diversity. Across the United States, there have been serious declines in pollinators such as butterflies and honey bees. These beneficial insects pollinate our crops and vegetables so they can produce our food. Because rain gardens are generally not mowed, have more moisture and better soils, they are an ideal place for a wide variety of flowering plants. In exchange for pollination, the flowers give the butterflies and bees food in the form of nectar. With a little bit of care and planning, your rain garden can have flowers and active pollinators almost every month of the year in Austin’s mild climate. You can do your part to decrease flooding, treat storm water, and provide wildlife habitat by building a rain garden on your property. 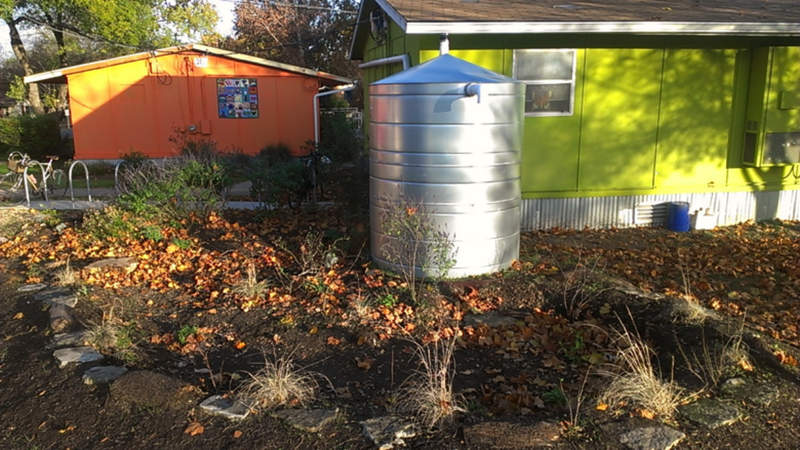 Go to www.austintexas.gov/raingardens to find out more about rain gardens, and instructions on how to build your own. Watershed Protection Department has been making progress in disconnecting impervious surfaces by working with the Austin Parks and Recreation Department to design and help install rain gardens in parks with drainage problems. Check out the new rain garden at Dottie Jordon Park. Dottie Jordan Park has a lot of drainage and impervious cover issues that will be mitigated by a rain garden. The rain garden, positioned between two swales, will receive runoff from the parking lot and allow for further retention and infiltration, as well as slowing the water down and decreasing erosion. Dottie Jordon rain gardens installed in Feb. 2015, a series of 3 storage bays. Bartholomew Park rain garden near splashpad. WPD staff home raingarden installed in 2012 and flourishing 3 years later.